Fragola by JONI. Made in Spain. Beautifully handmade in Spain. Classic Strawberry Suede. 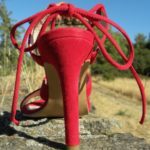 All Banou Couture's handmade shoes are final sale. Returns will only be accepted if wrong, damaged or defective items were sent to customers. Returns or Exchange will be accepted within 7 days of purchase ONLY on defective items. Returns will only be accepted on UNWORN shoes. 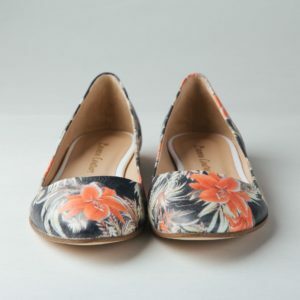 Marian and Joni shoes are handmade in Spain. Polishing your leather shoe and following the tips will maintain the life and longevity of your leather shoes. 1- To spray-on water repellent is an essential , a way to safeguard against the elements. Before application, use a warm sponge to prep your shoe. The gentle heat will increase the porosity of the skin, allowing for better absorption. 2- Choose a polish that matches your leather shoe. In most cases is better to apply CLEAR polish. Though suede shoes should be protected from water, Still most suede shoes are prone to scruffs, stains, and scratches. 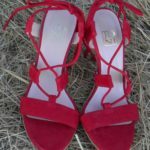 You can still increase the longevity of your charming suede shoes and keep them in a good condition by following the proper cleaning procedure. 1-To avoid water stains please place a towel inside the shoes and spray a thin layer of water evenly on the surface of the shoes. Now, scrub the stained area with a nail brush. 2-Gently brush away the trapped dirt and mud from the surface of the shoes using a suede cleaning brush. Keep in mind that you need to brush it in the direction of the fibers rather than going back and forth. 3-Allow the shoe to dry in a cool, well-ventilated area. Do NOT place them in front of fire or direct heat as it may cause uneven drying. In addition, quick drying can leave the surface rough. Placing the shoes in bright sunlight is also not advisable as it shall fade the color. It is recommended to spray a water and stain protector on suede shoes before wearing them. It shall help avoid stains and make it easier to clean. Make sure you brush it before and after using the waterproofing spray. To preserve the beauty and charm of your suede shoes, prefer to brush the shoes after each use, before storing them. 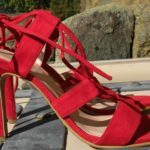 If the color of your shoes starts fading, you can spray a suede shoe dye of the same color on them. When dealing with tough stains that you have failed to remove, it is better to take them to a professional cleaner who specializes in leather and suede. Otherwise, improper and aggressive methods of cleaning may cause irreparable damage. Needless to say, do not wear your delicate suede shoes during the rainy season.